These cookies are amazing! Such a treat! I can only make them on very special occasions because I like them so much that I eat way too many. My family likes them too which is usually a good thing because they help eat them so I’m not eating all of them, but with these, I find myself hiding them :). Literally. My brothers would be proud :)! They still hide the guacamole from me whenever we make it out to WA for a visit, which is annually. These cookies are made with whole wheat flour and brown rice flour; no refined white flour! There is a little bit of evaporated cane juice which is a step up from the refined white stuff (this is just a little less refined which is why it’s the tan-ish color), but still sugar. And for the glaze, I put some of the evaporated cane juice into my high power blender and blended it until it became powder. I love that machine! If you don’t have a high power blender you can use regular powdered sugar, but remember, it’s a special treat :). Here are your ingredients. You’ll notice coconut sugar in the picture below and that’s because I blended it into a powder to put inside of the cookie, but then when I made the glaze for the top I made the powder with the evaporated cane juice. You don’t have to do that. It’s more work that way. You can use all one type of powdered sugar. But I wanted to so I did :). I grind my brown rice flour through my nutrimill first and then grind my white wheat flour since the wheat helps to clean it out. And the extract in the front of this picture is a maple extract. This one is called Mapleine. I bake the cookies on parchment paper so they’re less likely to stick to the cookie sheet and fall apart. And it’s so easy to just slide that whole sheet onto the cooling rack to cool once they’re out of the oven. And clean up is such a cinch! Some of my kids didn’t want nuts on the tops of theirs, so I left a few for them. But see how many I get :). J/k, I’ll share one with my hubby. Preheat oven to 350 degrees. Line 2 baking sheets with parchment paper and set aside. Whisk flour and cornstarch together in a small bowl and set aside. Mix together butter and sugars at medium speed in a large mixing bowl until creamy. Add egg yolk and maple flavoring beating until well mixed. Reduce speed to low and gradually add flour and cornstarch mixture and toasted pecans. Using a cookie scoop (or about 1 Tbsp if you don’t have one of those), make dough balls and place them on baking sheets and press down lightly with fingers until dough is about 1/2 inch thick. Bake 9-12 minutes until cookies puff and are very light golden brown. For the glaze: combine butter, powdered sugar, and maple syrup in a medium-sized mixing bowl. Add enough milk to make a glaze and whisk mixture until smooth. When cookies have cooled, spoon a little on the tops of cookies and with a circular motion use your spoon to bring the glaze out to the edges. Garnish with pecans if desired. Allow to cool. *Updated 1/29/13- finally got a chance to add pictures, almost a week later from when the post was put on here! My kids are out of school this week and will be the following two weeks. Which means I have very little time for anything besides cooking, cleaning and playing/teaching/working with the kids. So little time that I didn’t have time to get pictures of this recipe, but it’s so simple and easy and one that I LOVE and make often so I’m going to share it anyway and I’ll try and remember to take pictures of it the next time I make it so I can add them to this post. I love green smoothies. I drink them everyday and my hubby and 5 kids drink them daily as well…actually, Baby Nora doesn’t have some every day but sometimes she’ll drink off mine. Anyway, because we’ve had them most everyday for the past couple of years, I like to mix things up to make it a little different. This is one the whole family likes (I do make some that the family doesn’t like; like the ones with too much kale and not enough sweet fruit :)). 2 Tbsp ground flax or chia seeds or oat groats(or any kind of oats: steel cut, rolled). Flax and Chia seeds are really high in omega fatty acids which is nice. And all of these make your smoothie more nutritious and filling. Put water, orange juice, spinach, ground flax/chia seed/oat groats and banana in high power blender and blend until smooth. 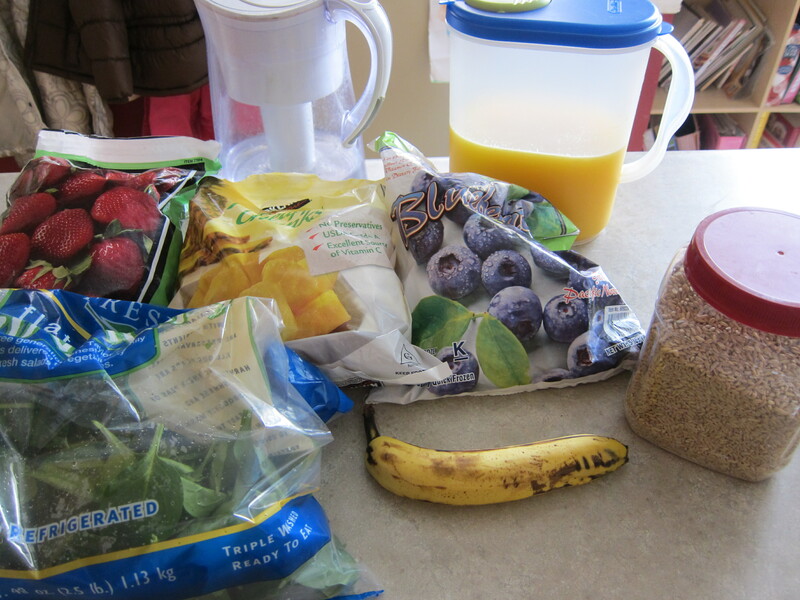 Add banana, pineapple, strawberries and 1 c blueberries and blend one cycle (about 50 seconds). Take a spoon out and try some. If it’s not sweet enough add 1 more cup blueberries. If you want it thicker(and colder), add a cup of ice and blend again. 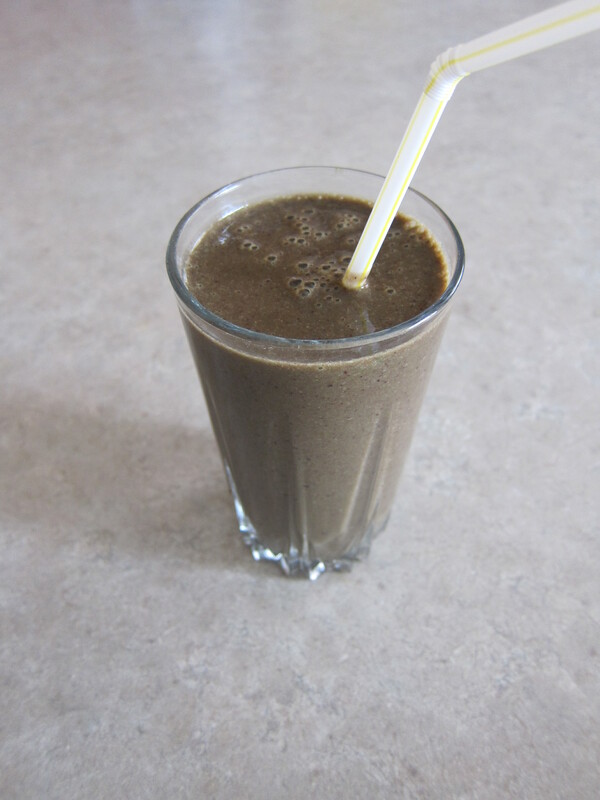 If smoothies are ever too thick, add some water or a little more juice, stir a couple of times and blend again. I like granola bars. I like them because they’re a quick snack you can grab on your way out the door. 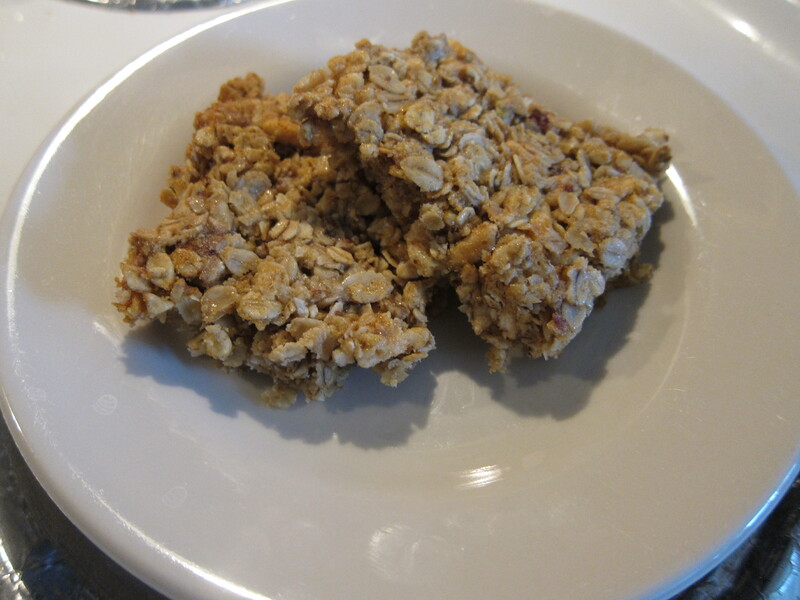 I like that many of them are filled with grains and nuts giving you energy and leaving you feeling pretty satisfied. And my kids like them which is a huge bonus. That being said, most of the granola bars you find in grocery stores have tons of ingredients with all sorts of additives and preservatives and refined sugars and flours so I won’t buy them. The exception to that is the Lara bar. But only me and my 2 year old will eat the Lara bar. Not even my husband will eat it! So what’s a girl to do? Make your own! I have a couple of different recipes I like to use and this is one of them. The puffed brown rice cereal you can find at health food stores and some Walmarts on the cereal aisle. And at my Walmart, you can buy the whole bag for $1. The only other ingredient in here that I think may require a little explanation is the medjool dates. You can buy them at most grocery stores (Costco carries them too!) in the produce section. Sometimes they’re sold in bulk, sometimes just in a bag or plastic container. I use four in this recipe and they’re a good, whole foods sweetener. I have pictured 4 medjool dates which I use as 1/4 c of my add-ins. You can buy them at most grocery stores (Costco carries them too!) in the produce section. Sometimes they’re sold in bulk, sometimes just in a bag or plastic container. They are a good, whole foods sweetener. Just in case you decide to use dates in your recipe too (which is totally optional! 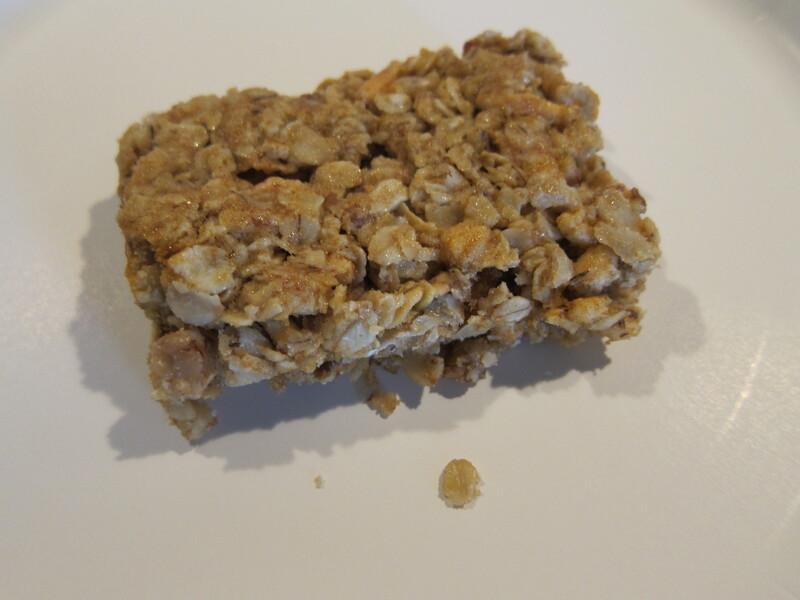 Sometimes I just do chocolate chips and coconut flakes), let me show you how to prepare them for this granola bar recipe. First you’ll need to remove the pit. This is super simple. All you have to do is take a small sharp knife like a paring knife and cut a small slit along the side and pull it out. 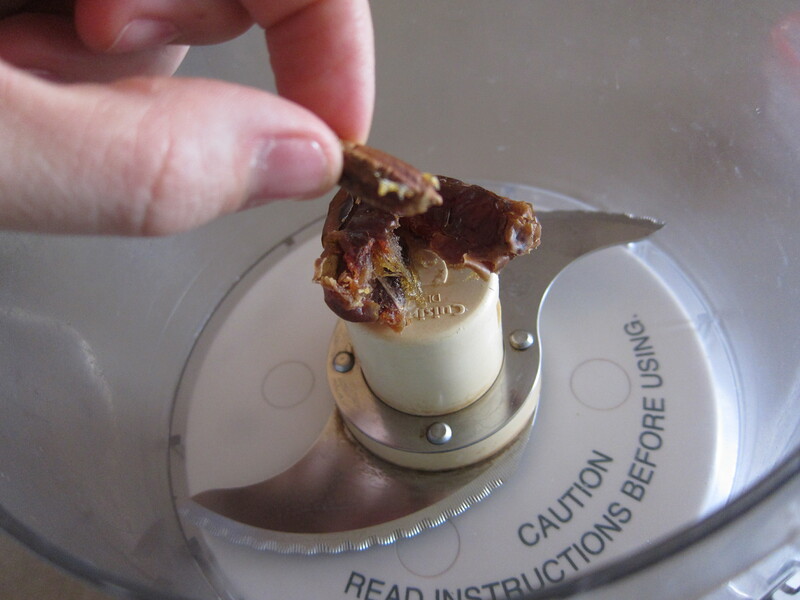 These pits are super hard, like a rock, so if you don’t do this, when you run your dates through you’re food processor you’ll know because it’ll be really noisy. I’m holding the pit in the picture below and the rest of the date is underneath. 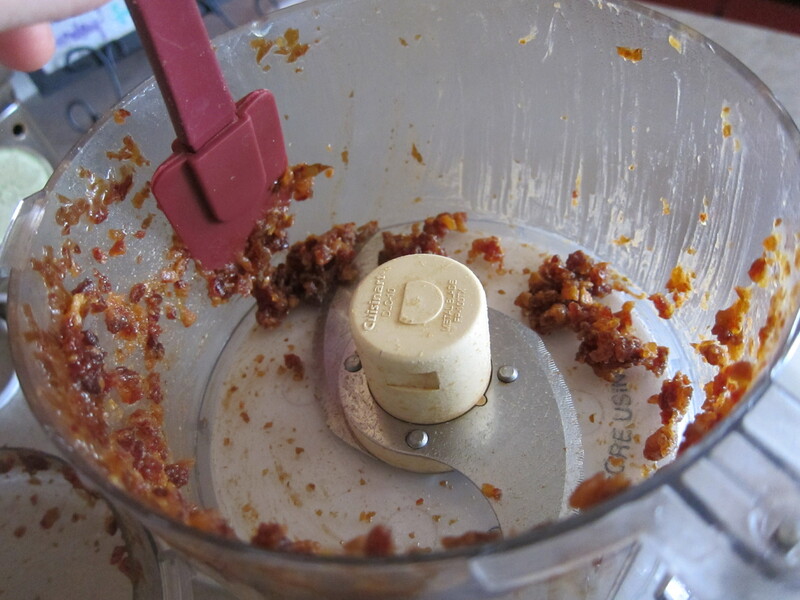 Once you remove the pits, put the dates with a little bit of water into your food processor and pulse several times until it looks like a paste. You can open the lid and scrape down the sides with a rubber spatula and pulse again if you need. It should look about like this when it’s ready. 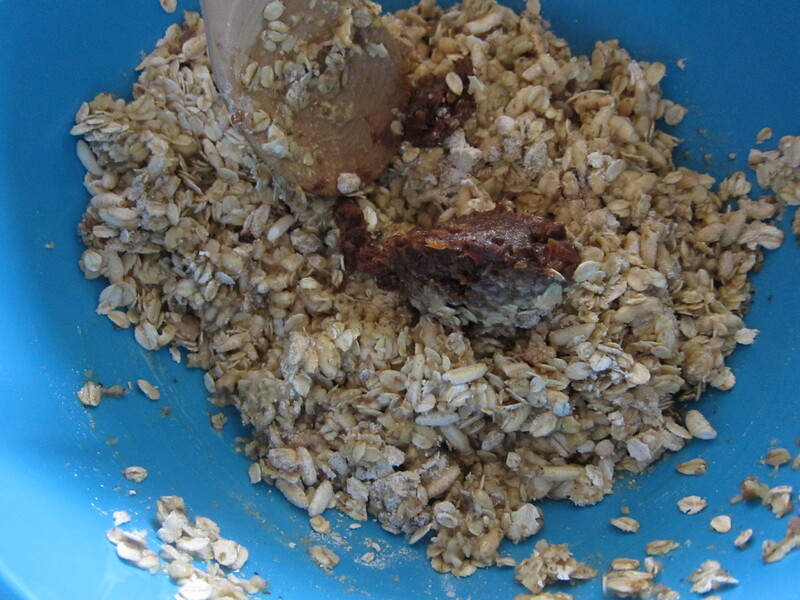 In a large bowl stir together oats, cereal, flour and nuts. Set aside. 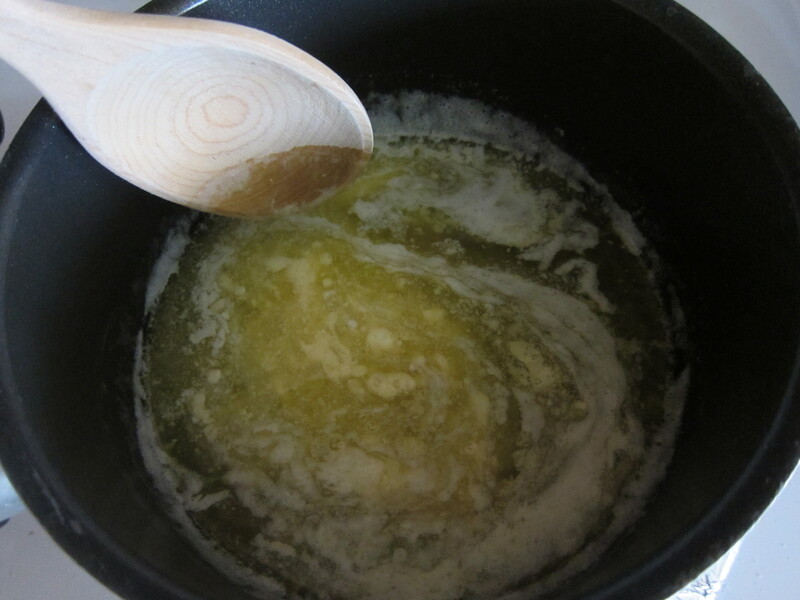 Melt your butter in a saucepan over medium heat. 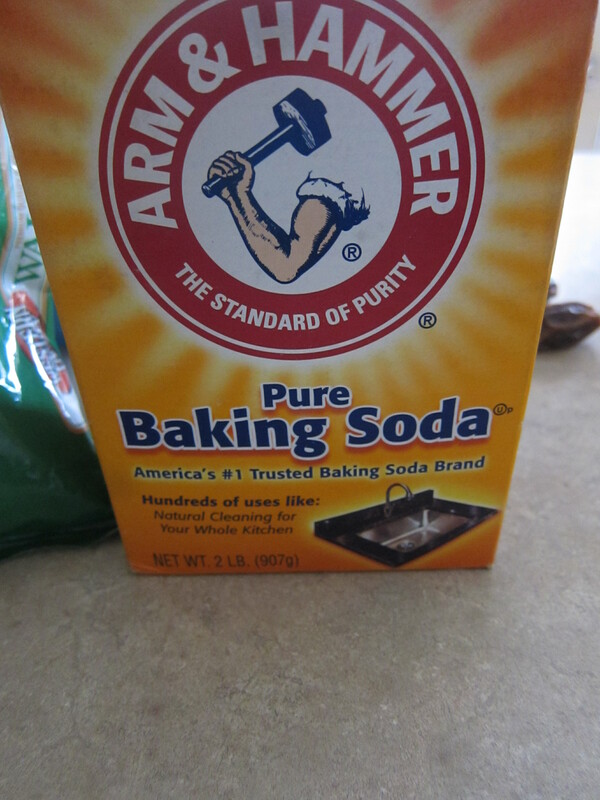 Add honey, vanilla and baking soda. Once it’s bubbly, cook and stir another 5 minutes. 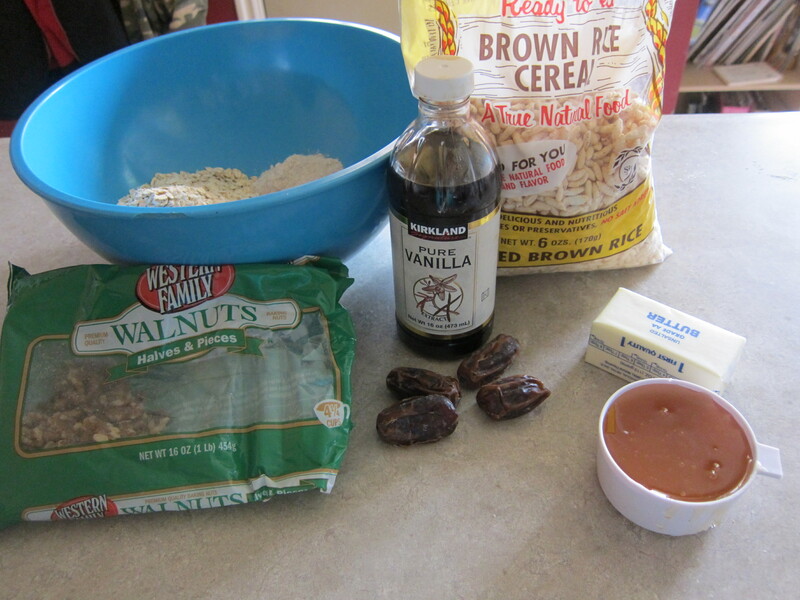 Mix the liquids with the oat mixture and then add the date paste and the unsweetened coconut flakes or whatever add-ins you’d like. You can buy unsweetened coconut at health food stores or Winco in the bulk section. Stir together thoroughly and then press into the bottom of a greased 9×13 dish. 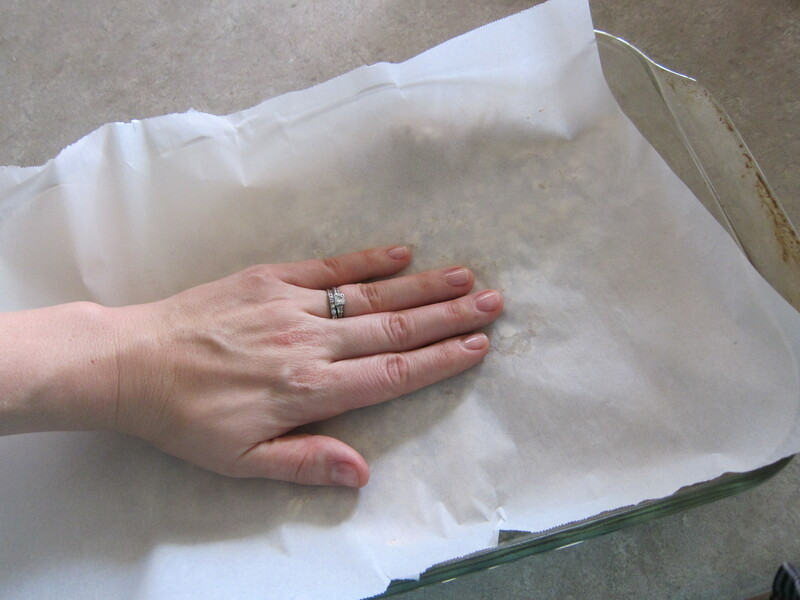 Use a piece of parchment or wax paper and your hand to press it down firmly. Bake for ten minutes until golden brown. 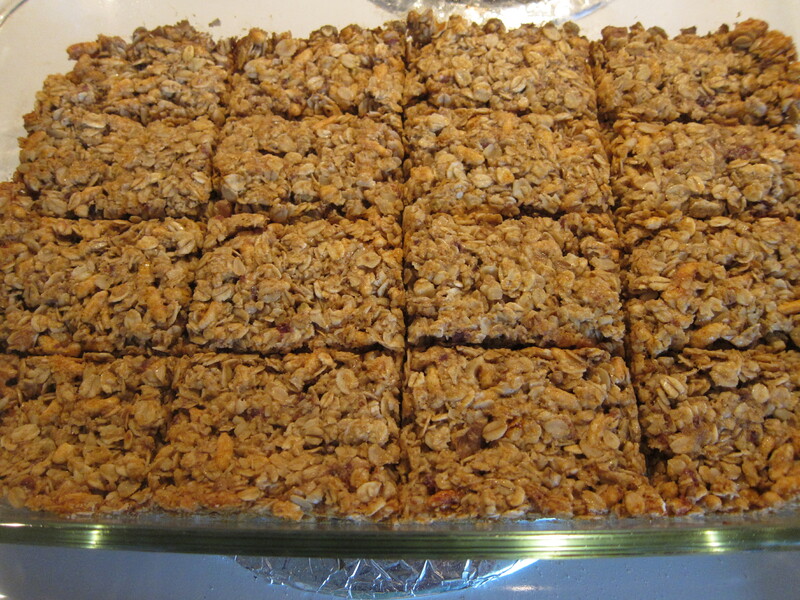 Allow to cool completely in pan and then cut into 16 squares. You can eat them right out of the pan, save them in a tupperware or individually wrap them in saran wrap to eat during the week. They’ll keep on the counter for several days or refrigerated for at least a week. Preheat oven to 325 degrees. In a small saucepan melt butter, honey, vanilla and baking soda over medium heat. Once butter is melted and bubbly cook and stir for 5 minutes. 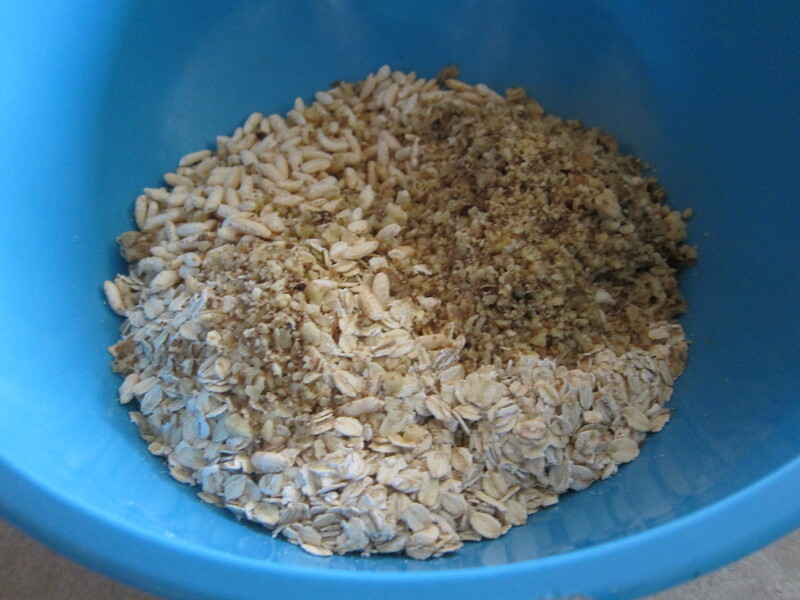 In a separate bowl stir together oats, cereal, flour and nuts. Mix the liquid with the oats. Stir in Add-ins. Press mixture into a greased 9×13 dish using a sheet of wax or parchment paper and your hand to apply pressure. Bake for ten minutes. 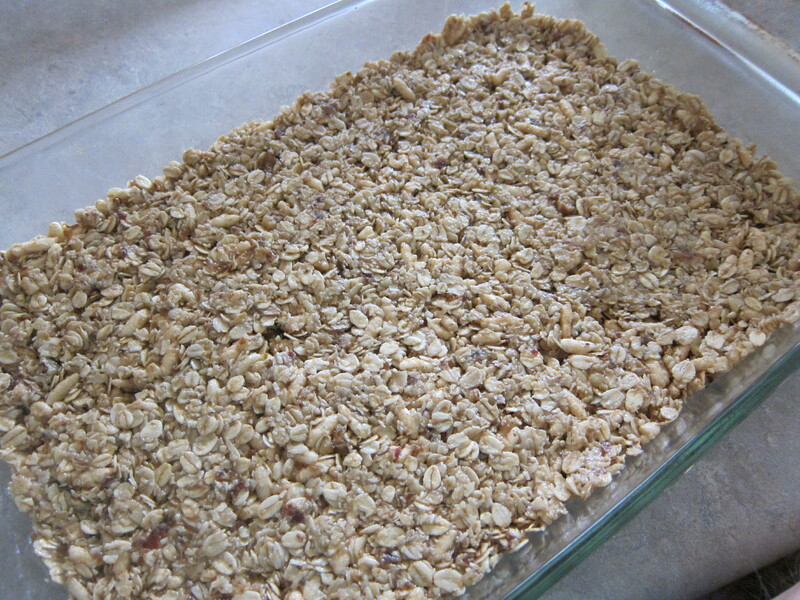 Allow to sit in pan and cool completely and then cut into bars (I usually cut into 16). I think I’ve mentioned before that my dad was born and raised in Mexico. He was born in the 1920’s and his family raised lots of animals and made most of their food from scratch. He remembers his mom and the other women in the family making tortillas regularly. Once my dad moved to the USA, he opened up a Mexican restaurant in the Seattle area with my mom. Needless to say, dad is known for some of his amazing Mexican foods. 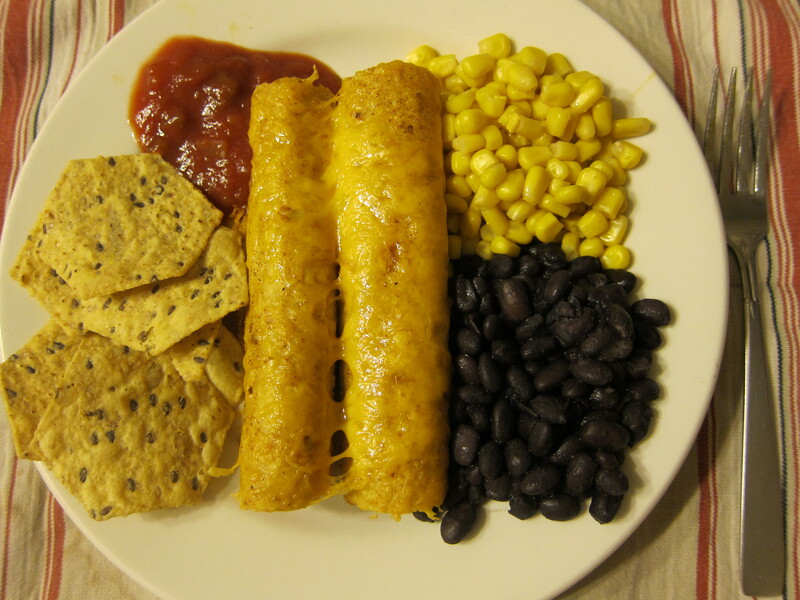 The foods that I remember people requesting he make for different events were rice, beans, enchiladas and guacamole. 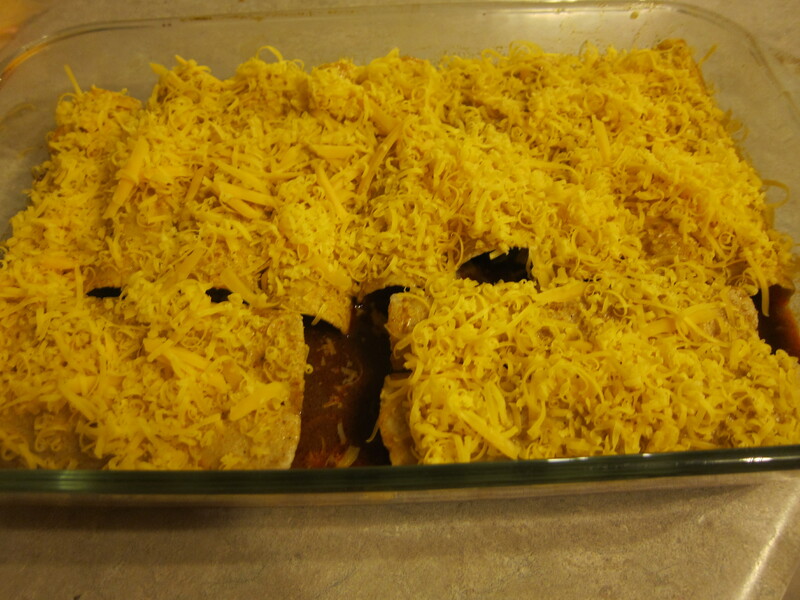 Today I’m going to share his enchilada recipe, which is another one of those rare meals that my entire family loves. We’re going to make the sauce from scratch and then the rest of the recipe is really quite easy and simple. In a medium saucepan over medium heat melt your butter(or warm the avocado oil). Add flour, one teaspoon at a time, stirring well in between. 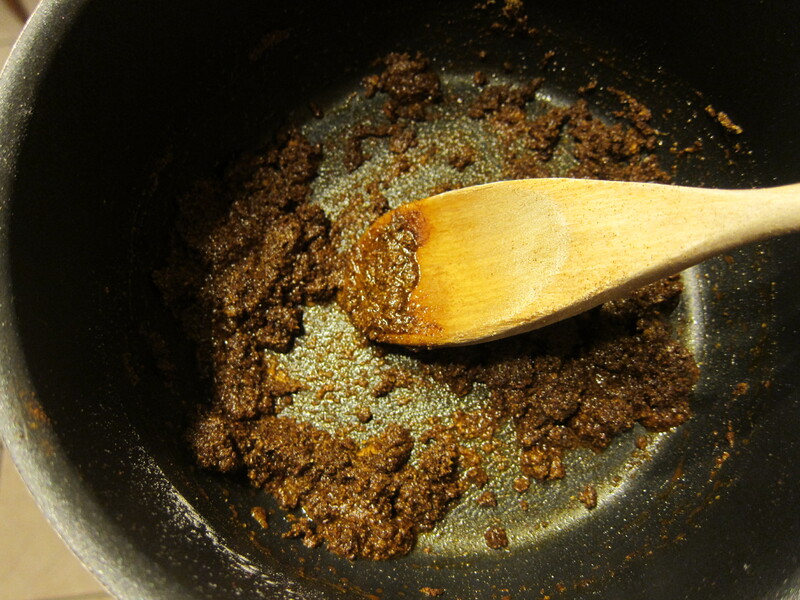 Add chili powder, cumin, garlic powder and white pepper and stir to combine; this mixture will be almost dry. Add the chicken broth and stir. Simmer for 10 minutes. 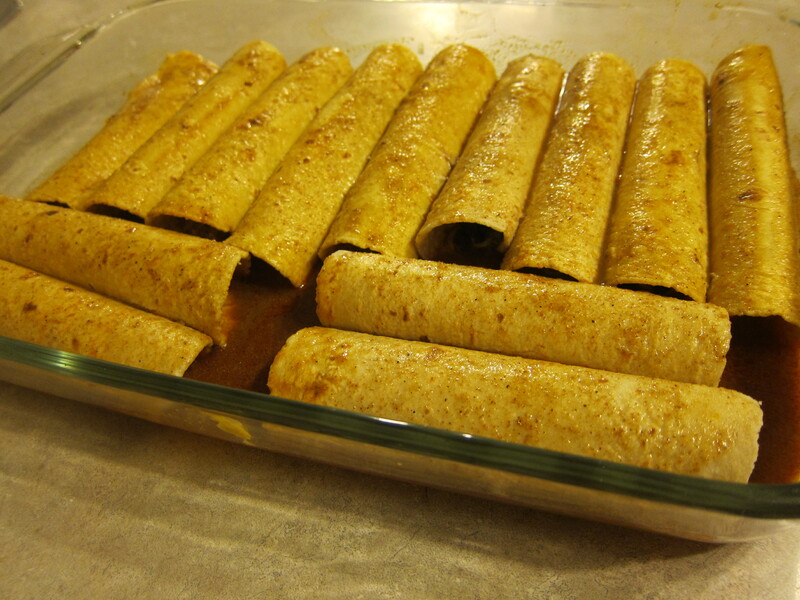 This recipe makes enough enchilada sauce for 2 9×13 pans or about 24 corn tortillas. If I’m making enchiladas for just my family, I only make one pan and then I save the rest of the sauce in a pint jar which I’ll use again in the next month, when we want to make another batch of enchiladas. 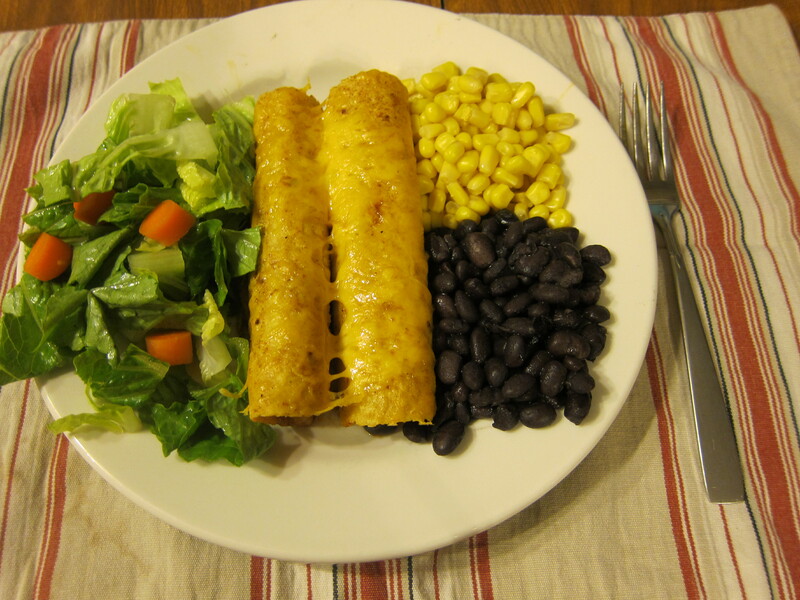 Which makes the next enchilada dinner really easy and fast. 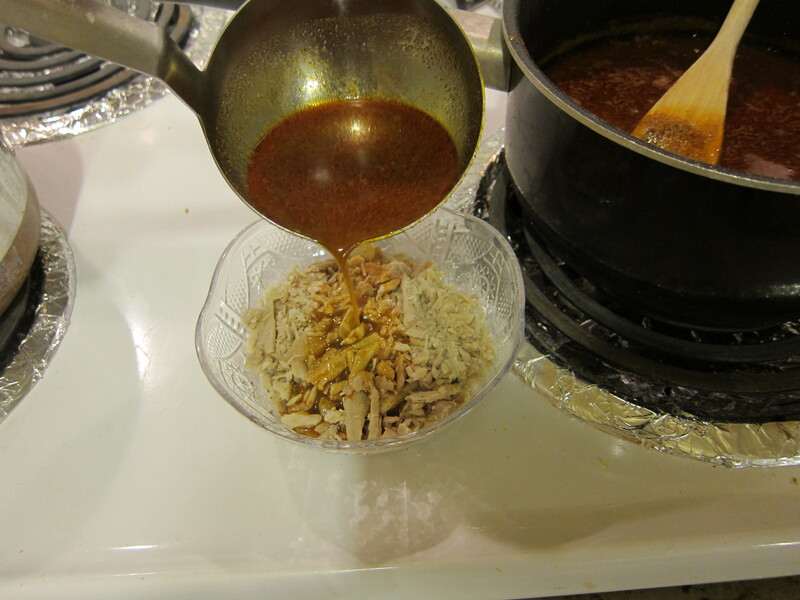 If you’re going to use shredded chicken (or another meat), I like to boil the chicken and then shred it with forks once it’s nice and tender and then I put it in a small bowl and pour over a little bit of the enchilada sauce which gives it a really nice flavor. Preheat your oven to 350 degrees. 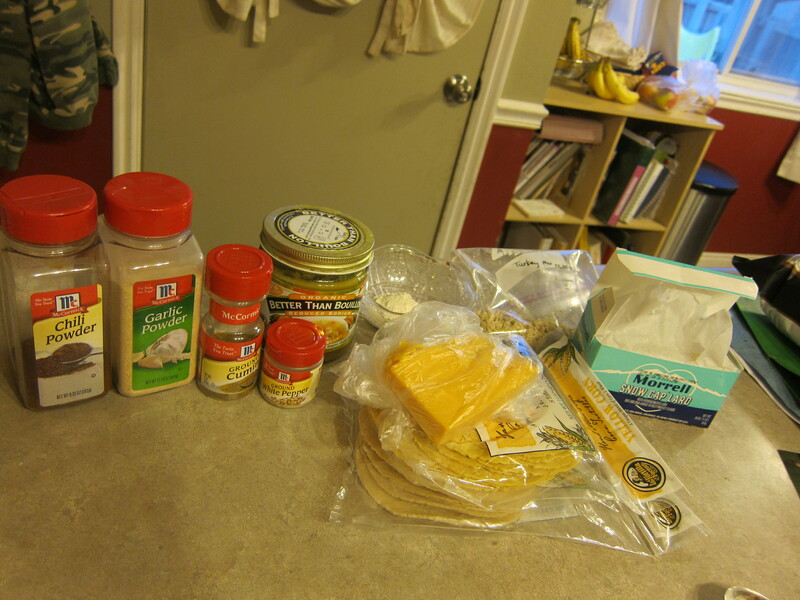 Shred some cheddar cheese to use as a filling and to go on top of the enchiladas. 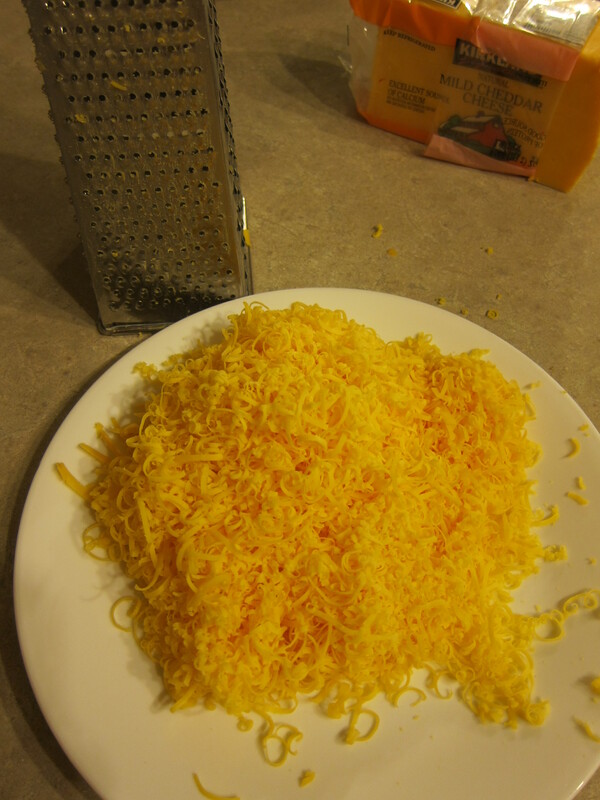 My kids prefer mild cheddar but use whatever you like. A little Monterey Jack mixed in is good too. 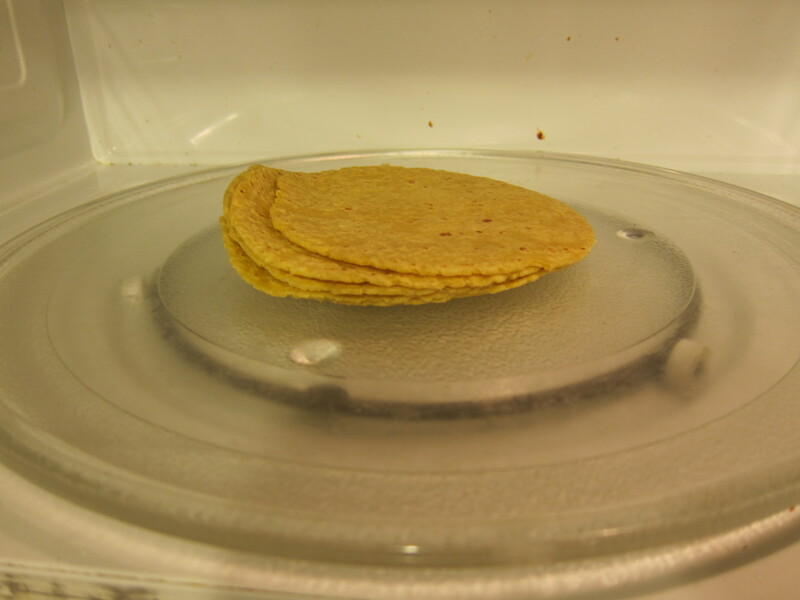 I warm up my corn tortillas (any brand), 5 at a time, in the microwave for 30 seconds. Place them in your ungreased 9×13 pan, seam side down. 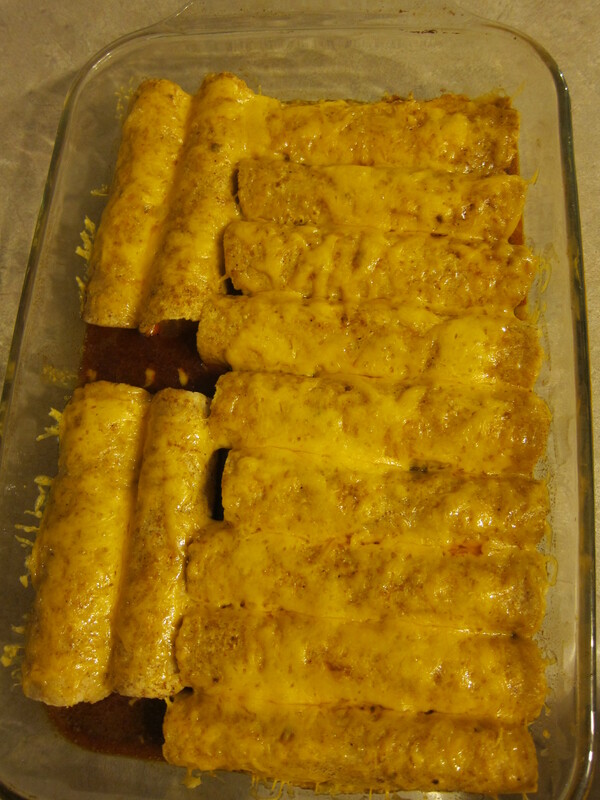 Ladle or spoon your enchilada sauce over the top (only use about 1/2 of the sauce per 9×13 pan), making sure to coat each tortilla with the sauce. 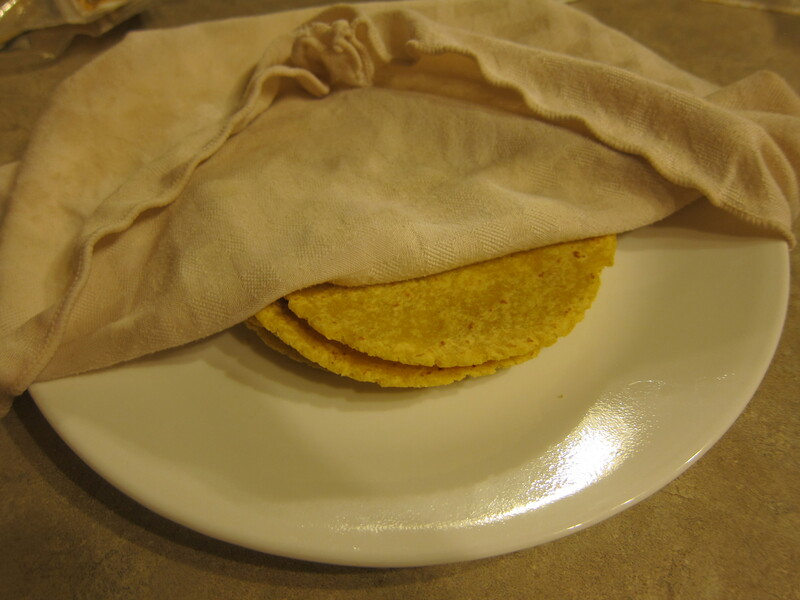 Don’t leave any corners or any part of the tortilla dry because it’ll get crunchy when you bake. I use the spoon and spread the sauce over the tortillas. And cook it until the cheese has melted, about 10 minutes. You can serve this with beans, salad, rice, corn, sour cream and guacamole, salsa and chips or whatever else your heart desires! In a medium saucepan over medium heat, melt butter. Add flour, one teaspoon at a time, stirring well in between. 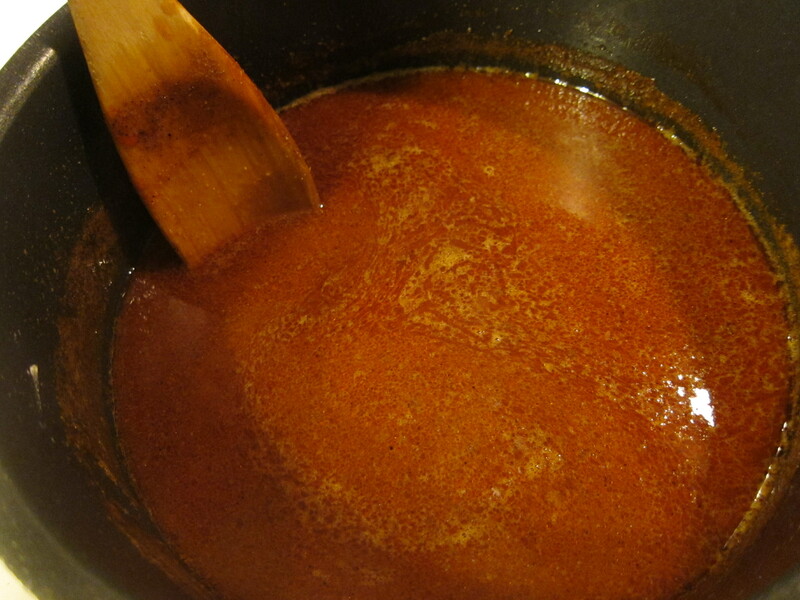 Add chili powder, cumin, garlic powder and white pepper and stir to combine; this will be almost dry. Add the chicken broth and stir. Simmer for 10 minutes. Preheat oven to 350 degrees. 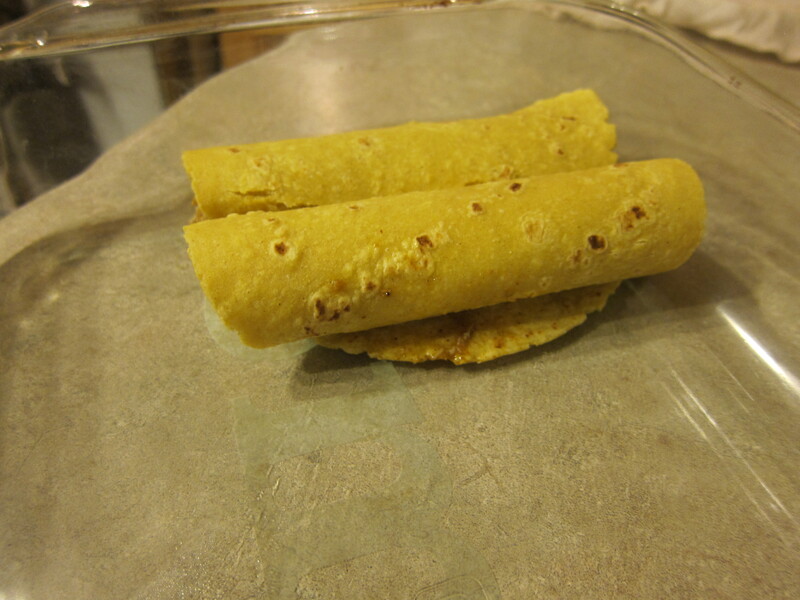 To assemble the enchiladas, warm tortillas in the microwave, 5 at a time for 30 seconds, and then cover with a warm, damp dishcloth (this will help the corn tortillas not crack and fall apart). 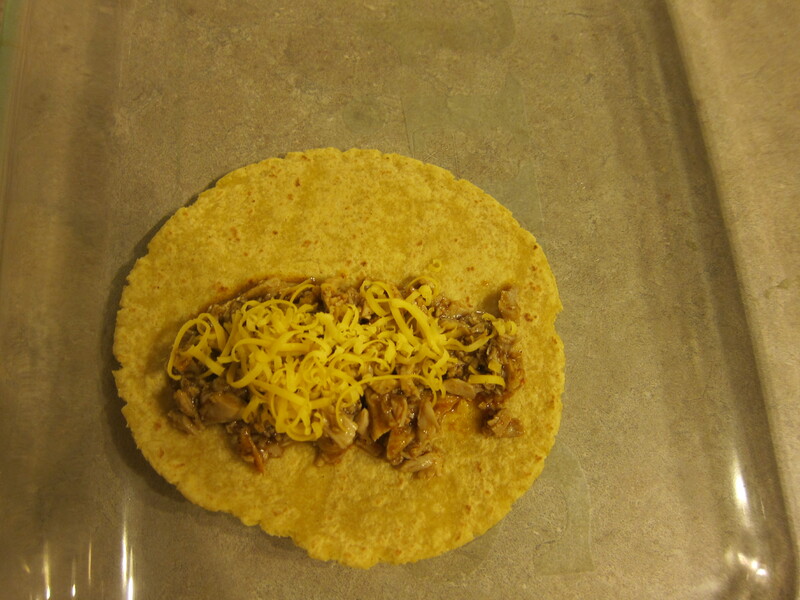 Put grated cheese and meat in bottom third of tortilla and roll up. Place in 9×13 dish, seam side down. Cook in oven until cheese melts, about 10 minutes. This is a fun festive salad. The red craisins are pretty and stand out, but they do have added sugar so if you really want to avoid that you could use raisins instead…it just won’t be as stand-outish as the red craisins. There are several things you can do earlier on in the day when you have time, or even a couple of days before hand to make this salad really quick and easy to throw together. I like to make candied pecans in the oven using maple syrup and store them in an airtight container so they are ready for later use. They’ll last at least several weeks, maybe longer. The vinaigrette salad dressing is another thing you could prepare a week ahead of time and store it in your fridge. The morning/afternoon of, you could chop your apples and soak them in orange juice and wash and chop your lettuce. Then when dinner rolls around and you’re ready for your salad, just throw all the ingredients in a large dish, toss them together and it’s ready to go and looks beautiful! Wash and chop lettuce and set aside. Measure out craisins or raisins and candied nuts and set aside. If you don’t have candied nuts already made you can make them in about 5 minutes by combining 1/2 c nuts and 1/4 c sugar in a medium skillet over medium heat. Stir constantly. After a few minutes, the sugar will look very fine and then a few minutes after that, it will start to liquefy. Be sure to stir around really well at this point. The syrup will begin to darken and will coat the nuts. When they reach a golden brown color, remove from heat. Stir occasionally as the nuts begin to cool. Allow to cool completely in the pan or in a bowl. Chop blue cheese or Gorgonzola very finely. You want crumbles, not chunks. Feta works too if you don’t like those cheeses. When ready to serve, toss lettuce, cranberries, nuts, apples, and blue cheese in a large bowl. Unless serving this at a large social event, you may want to serve the dressing on the side and drizzle on individual salads because if you have leftovers covered in salad dressing the lettuce will wilt. In a blender, combine vinegar, honey, garlic, salt, and pepper. Place lid on blender and blend on high. While blender is running, add oil in a steady stream. Store in refrigerator for about 2-3 weeks. Shake well before serving.